Point Lonsdale Cottages are located near the beach in Point Lonsdale. From Geelong - follow the signs to Queenscliff on the Bellarine Highway - (the B110). Turn right into Point Lonsdale Road (Near the Beacon Resort ). Follow Point Lonsdale Road for one minute and look out for the Point Lonsdale Cottages on your left hand side. We have a brush fence and a sign on the fence. Parking for the Cottages is available off street. From the Queenscliff Sorrento Car Ferry - follow the road into Queenscliff and continue alone this road (Hesse Street) until you come to a roundabout near the Bowling Club with a sign to Geelong. Turn right and follow this road for about four minutes. You'll see a turnoff to your left and a sign to Point Lonsdale. Follow Point Lonsdale Road for one minute and look out for the Point Lonsdale Cottages on your left hand side. We have a brush fence and a sign on the fence. Parking for the Cottages is available off street. From the Great Ocean Road (or Ocean Grove or Barwon Heads) - Follow the signs to Queenscliff, but remember that you will get to Point Lonsdale before Queenscliff coming in this direction. Once on Shell Road in Ocean Grove follow Shell Road until you come to a rountabout (about 10 minutes from the town of Ocean Grove). Come straight through this roundabout and continue following this road until you get to an intersection by the BP service station. Turn left here into Point Lonsdale Road and look out for the Point Lonsdale Cottages on the right hand side of the road. Bright, white & beachy spa cottages with lots of little extra personal touches! Super comfortable pillow-top queen beds, thick fluffy towels & good plunger coffee & tea. Relax in your large corner spa for 2 or enjoy a drink on your private sunny deck and listen to the ocean. 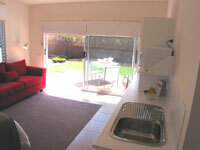 Located 1 block from the beach and 10 minutes walk to the shops, cafes & restaurants of Point Lonsdale. 3 minute drive to the historic town of Queenscliff. New architect designed cottages are luxuriously furnished with stylish beach decor. The 2 cottages have a queen bed & double sofa bed in the same room, ensuite with spa bath, kitchenette with microwave, sink & fridge, air-con & ceiling fans and each cottage is north facing with private decks overlooking native garden & lawn. The 2 cottages can be interconnecting for families or two couples holidaying together. Each cottage has a queensize bed and a double sofa bed in the same room. Ensuite has a large corner spa and heated towel rail. Each cottage has a private north-facing sunny deck. Kitchenette has sink, fridge, microwave, toaster, kettle. TV, DVD/CD player, air-con & heating. If a booking is cancelled within 14 days of arrival then full forfeiture of $100 deposit applies. If no notice of cancellation is given the full accommodation fee will be charged. Bookings that are postponed (min. 72 hours notice) will not incur any charges. Bookings cancelled outside 14 days of arrival will incur a $25 administration fee.